Chris Alberti is all too familiar with the agony of a child faced with making tough decisions about a parent's medical future. When his father suffered blood circulation problems in 2006, doctors had to amputate part of his father's left foot, a decision that meant he would require expert medical attention daily. It was a trying time for Alberti and his family, who had to tackle the tough decision of whether or not to put their father in an assisted-living facility. But the decision also spurred the 59-year-old Boston native to make a dramatic change in his own life, shifting from the number-filled world of government finance and investment banking to helping set up what he says is one of the most comprehensive assisted-care facilities in China. "It was one of the major drivers for why I'm now doing what I'm doing," he says. Alberti is director and one of the founders of Cascade Healthcare, or Kai Jian in Mandarin, a joint venture with US senior care giant Emeritus and one of the largest foreign players pushing to get involved in China's senior assisted-living sector. Cascade's first assisted-living facility opened in Shanghai's Xuhui district in mid-October, and is one of more than a dozen set to open in China in the near future. 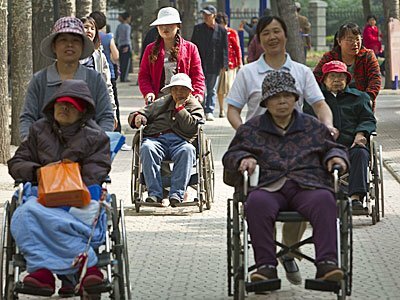 By focusing on the service side of assisted living, he says they are producing a business model that has not yet been tried in China. Despite the recent easing of restrictions allowing wholly-owned foreign enterprises to compete in China's senior-health sector, Cascade is opting for a joint-venture, working with domestic companies like real-estate giant Sino-Ocean as they plan to establish more than a dozen care centers in Beijing and beyond. Alberti says they made the decision to enter into a joint venture in order to ensure that their product offers a genuine local touch. "When you're dealing with issues that are closest to home to Chinese people such as taking care of your parents, you want the benefits and clarity that a local partner can bring to an enterprise," he says. "We're not bringing a foreign company to China. We're creating a Chinese company affiliated with foreign companies, but with a design toward creating a great Chinese brand." Describing their newest facility as "Western with Chinese characteristics", Cascade's newly opened Shanghai facility has adjusted for the Chinese market by incorporating local designs and elements of traditional Chinese medicine. But he says it's also important to keep Western elements, specifically in the realm of care, to help distinguish Cascade from local competition and continue to learn about this uncharted dimension of China's health industry. "If we do a good job here, there's an enormous market and we'll all do well and maybe, just maybe, we can make a difference in China."